~ bizarre island ~: How to Plan a Perfect Afternoon Tea! How to Plan a Perfect Afternoon Tea! We decided to combine a "d for delicious" and "c for craft" video together~ Valentines day is coming and the idea of a non-traditional Afternoon tea date rather than a dinner date would be really cute. So... we are here to present our ultimate guide to a perfect cream tea scenario. Just a few steps and it will transform your ordinary get-together into a chic, "bougie" and Instagram-worthy party! *These steps work for a lot of different party scenarios, just keep in that in mind so you can elevate any party/get-together you are hosting or planning. This is going to be quite a long one so, get a drink and get comfy! First, you have to think about the "event" you are planning for...like a "pre-plan". There are a few questions you should ask yourself before starting. 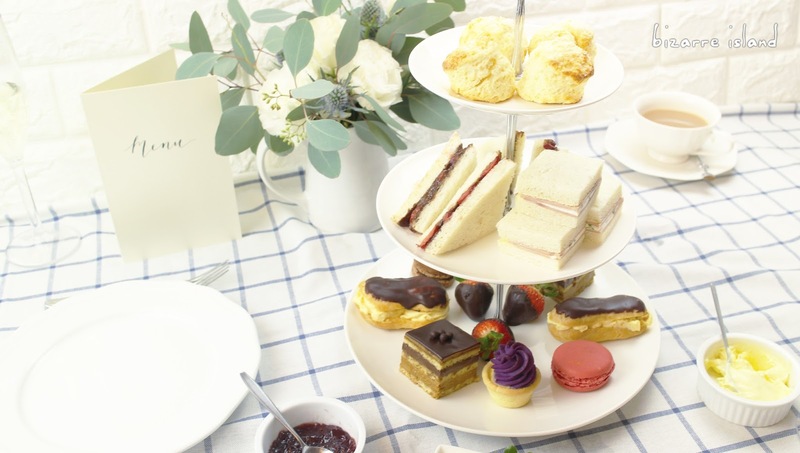 *We are going to use Afternoon Tea as the "event" as an example, because this is an Afternoon Tea guide after all so feel free to "sub" your own event and go through the process with that kept in mind. Q1. Do you have time for an elaborate "all-out" Tea party? or are you aiming for a quick get-together but still want it well put together and not too shabby? This question is a basic guideline on how much time you are willing to put into it. But time does not equal to results. Even if you chose the latter, you can still create good results with making smart choices. Q2. What budget are you aiming for? In our opinion, budget is not the most defining thing of the "scale" of the event. It more defines how much effort you can "spare". An all-out high budget event can be extravagant, anyone can shell out tons of money and make a good party, so we will not be focusing it. After answering the above 2 questions you can start actually planning the event. If in Q1, you've answered the first choice, you can start planning by choosing a "theme/colour scheme" of sorts. For example, vintage floral, pastel-y or neutrals etc. Going all-out means you are going to coordinate everything to the theme. You may have to spend time to find matching stuff or spend money to buy matching sets. It depends on the budget you have answered in Q2. Having a lower budget doesn't mean you can't have nice stuff, you just need to put more effort into it. It is the difference between buying everything matching / DIY-ing everything to match. In this scenario, you can't really afford to choose a "theme" but you can work with what you have. Pull out everything you have kept in the dusting cupboards for ideas and "props"/ utensils. Not everything must be matching but they have to make sense. Added in some DIY components and you will get decent results. not the best Champagne flutes, but works! Now you have those two mindsets in mind, just follow our 1-8 components guildline and I promise you that your event will not come out shabby at all. Tablecloth is really crucial in a nice setup. It gives a subtle impression of classiness and helps to cover an ugly table or a plain jane table. 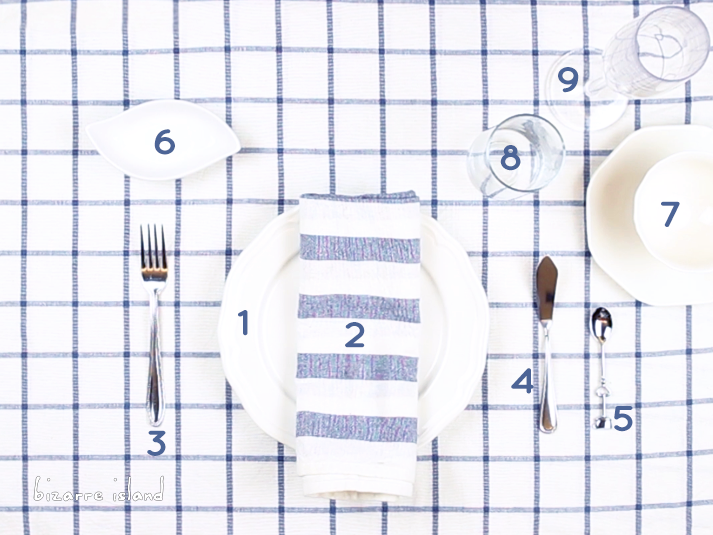 - All-out mode: Usually if you have a theme to match, the perfect "backdrop" will be an all white tablecloth. White tablecloths brings out the colour in your centrepiece, food, utensils. If you are feeling a bit more fancy, you can do a white on white embroidery. You could also do a pastel/light colour of your main theme colour. For example, floral tea sets that are bright pink and white with flamingo-coloured flowers, you can go for a light pink tablecloth to match. 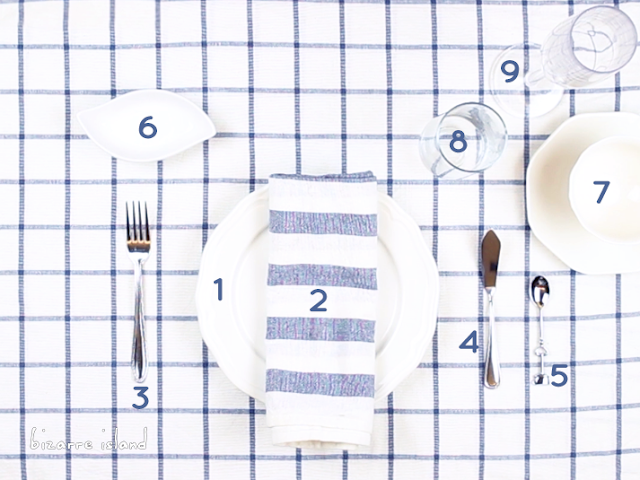 - Skimp on time mode: At this instant, all our platings are white ceramic with silver utensils so we chose a patterned tablecloth as it adds some interest into the setting. Because ours is a all white plates, they would be perfect paired with a fancy tablecloth. I imagine if you do it with a wine red tablecloth and switching out silver for gold, it can instantly be turned into the most romantic setting add some candles and you got the vibes. Anyways, rambling to much, back to choosing tablecloths. If you are going for a mixed and matched patterned plates and teacups,from your dusty closet or borrowing from friends and neighbours, you can do a plain pale pastel as tablecloth to pull the setting together. If you are on a penny pinch, you can get great options at the thrift store or just find something in your home to work with, get creative and surely something will fit. Real tablecloth, curtains, non-fitted bedsheets (find a thicker fabric), raw fabric, these all can be turned into tablecloths. Our tablecloth came in raw fabric and we just hemmed the 4 sides, done. Having a centrepiece will let your guest have a focus on the table, it adds interest and brightens up the table, basically it is the decoration of the table. It can be any sort of centrepiece - flowers, candy, fruit, fairy lights, candle trays etc. Choose something not too complicated. - All-out mode: Choose something that fits your theme and you are good to go. It really depends on the theme you have, so you might have to rely on instincts a bit. Fresh flowers are "easy" centrepieces, it usually goes with most of the settings, so if you really have no idea, go to a florist and tell them your theme, find a couple reference photos on the internet and ask them to do it. - Skimp on time mode: Buying pre-made centrepieces that are reusable is a good choice but doing a simple flower arrangement would smell good, feel refreshing and most likely impress your guess in your "taste" and "skill" which both of them you can easily fake *lulz* Below is how we did the one in our video and some tips and tricks for a easy floral centrepiece that can be done within 20 min. For a simple floral centrepiece, you need at least 3 elements, 1. main flowers 2. filler flowers/secondary flowers and 3. some sort of foliage. Main flowers should "pop" be big-ish stands out alone. We chose a white Eustoma flower to match our non-theme and they look beautiful with an affordable price tag. Secondary flowers/fillers are sort of the "side cast" of the bouquet, they are important to make the bouquet great but never gets "top-billing" They need to have their own characteristic that adds texture and depth to the piece but not so overpowering that it steals the spotlight. We chose Sea Hollies as the secondary plant because they have a slightly blue hue that matches our tablecloth and the mild blue colour works really well with our main white Eustoma flowers. Hosting an "intimate event" like friends get-together or a couples date, menus are absolutely redundant almost an overkill when you are just prepping this yourself but this is what makes it a little "formal", a little more "professional" and a little more "put together". It gives the impression that you hired someone else to do the work and it is part of the package it came with. Suddenly, everything looks bougie with a simple detail. - All-out mode: Keeping in the theme, choosing a frame and stand for your menu. Using a nice frame to frame up your menu keeps it up right and eye catching. You can colour or decorate the frame to your theme. As for the menu inside, you can print it or write it yourself. 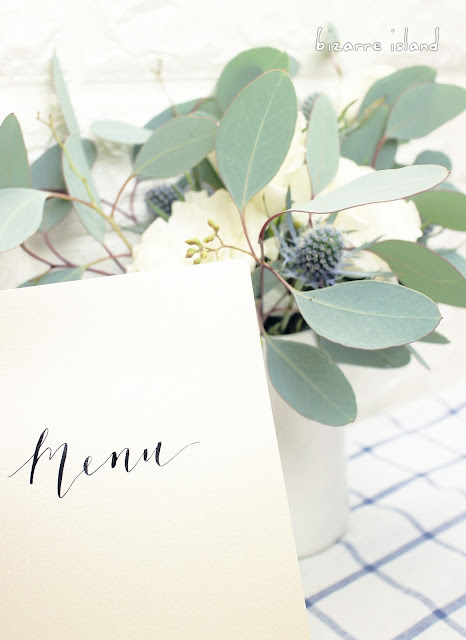 If you want it nice and have a little more budget, finding an Etsy calligraphy artist and buy a custom menu would be a good option too. - Skimp on time mode: Menu's can be simple and still look good, printing/ writing on pearlescent card stock have a minimalistic look to it, making it simple and elegant. If you are going to print your menus and don't have thicker card stock, we suggest you can print small individual menus and put it in their napkin. Setting up a table is crucial for a well put together event. It conveys the idea that you know what this is about. It tells guest what they should expect and how they should "act". For close friends/family, it says that you put a lot of thought into it, that you appreciate them much that you try to impress them. For an Afternoon Tea table, there is a list of things you need to include. * 3 Tiers Serving plates are essential for plating your food, but you can use different things to make them. For example, a jewellery box can me a makeshift 3 tier stand, you can stack cups and plates to make a tiered stand. Use some creativity, different household items can be made into a cute stand! The food and the tea is the spotlight of the event, your guest should be enjoying it during the event. Depending on the event, the size, the variety and the quantity of the food should be considered. As we are using Afternoon Tea as the example, all foods should be finger food sized. You should have 3 tiers of different varieties of "snacks" and each person should get 1 of each variety with the exception of fruits. Some Savoury Tea Sandwiches and an array of desserts and sweets. You can totally buy them in the store and plate them on a nice little tray, This way you can save some time but you may not be able to choose the size you'd like. Or you could opt to make it yourself to save some money and customise it to how ever you like it. Or a mix of both, buy some and make some. That way you can control your time spent on the food and the quality of it. Tea!Tea!Tea! Its all about Tea. Cream Tea's are there for you to enjoy the tea so serving the full experience with a well made tea tray is the way to go! You need all the essentials to make up the tray. Tea leaves, Tea pot with hot water, sugar, lemon, milk, tea towel. Guest can add their own fixin's to their taste! Even if you are an all-out/skim on time, you should have a tea serving tray! Champagne is totally optional! You have it? Great! But if you don't? No big deal! My friends are not fans of alcohol so we've mimic the vibes with a non-alcoholic sparkling grape juice. Adds a little pizzazz to the whole bougie experience. - All-out mode: Get a bottle of nice champagne and chill it thoroughly. Break out your nice precious champagne flutes or get a pack of 6 at ikea, they look nice too. - Skimp on time mode: Skip the champagne!! lol. 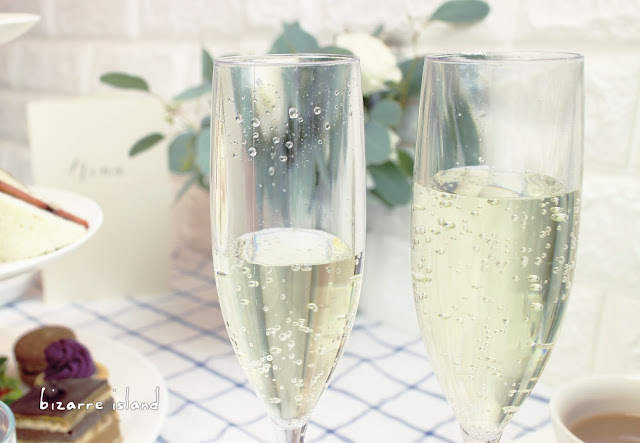 Nope, I am not here to tell you that~ Ikea have nice affordable champagne flutes but if you still want to lower the cost, picnic champagne flutes are a perfect choice, just choose one that has a decent "realistic" shape. Picnic flutes are plastic so prices should be in the budget but if you are planning to host more than 3 events/dates/parties/get-togethers a year, buying Ikea flutes will be more cost effective. Thrift stores are good options too but to save you the hassle Ikea really has some cute cheap flutes. Serving mimosas are also a great choice of alcohol for the table, they have a cute vibrant colour, you can use a lower grade champagne as it is a cocktail and you will use less champagne overall for each drink, money saved! Omg, this is such a long-winded post and it is all over the place. Hopefully it is not too confusing and after such a long read that you have learnt something "new"from it or at least got entertained by it.